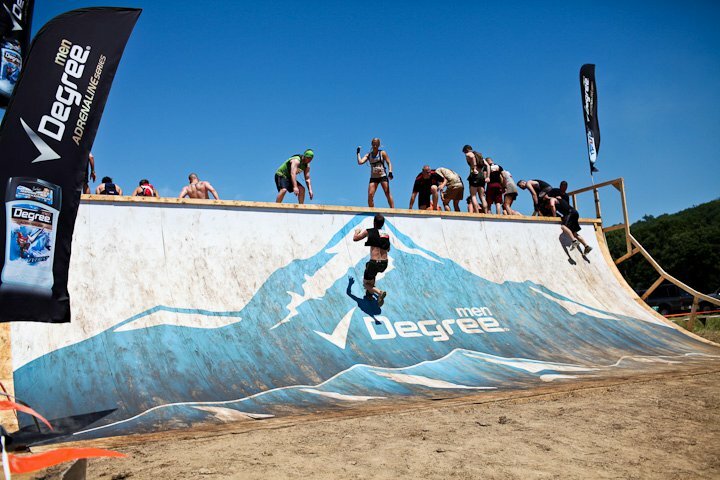 After the “Walk the Plank” obstacle, in my mind, I was running downhill. I felt little anxiety about the remaining obstacles, and so the greatest challenge would be to keep running until the end. After taking a short water break and eating(?) some energy gel, we ran for about half a mile before reaching the next obstacle, Spider’s Web (#15). This was basically a 10 foot cargo net built into a hill. This was a ridiculously easy obstacle, since the hill gave the net all kinds of stability that cargo nets don’t always have. Plus, there was no need to climb down the other side. That led to one of the longest runs of the course, and at this point the distance was really starting to get to me. I was pushing the upper limit of the furthest I had run (6 miles) and with some of the adrenaline gone after the Plank obstacle, it became about grinding it out on the run. We came to another set of Berlin Walls (#16) which I have written about, then after another short run came to Greased Lightning (#17). This was not so much of an obstacle as a giant slip and slide down a hill. So much fun! This was one of the highlights and a great pick-me-up from the long runs. After another run, we came to the Firewalker (#18) which was a 25 meter winding run through blazing kerosene soaked hay bales. 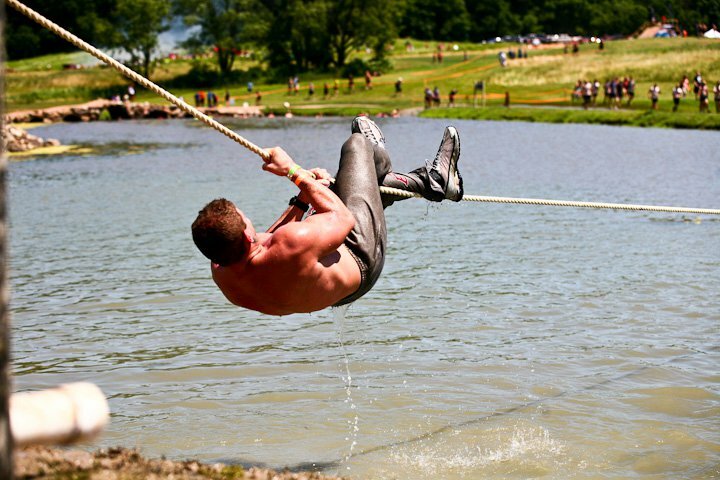 At first, I thought of it more emblematic of the Tough Mudder than as an obstacle, but it was actually pretty cool. 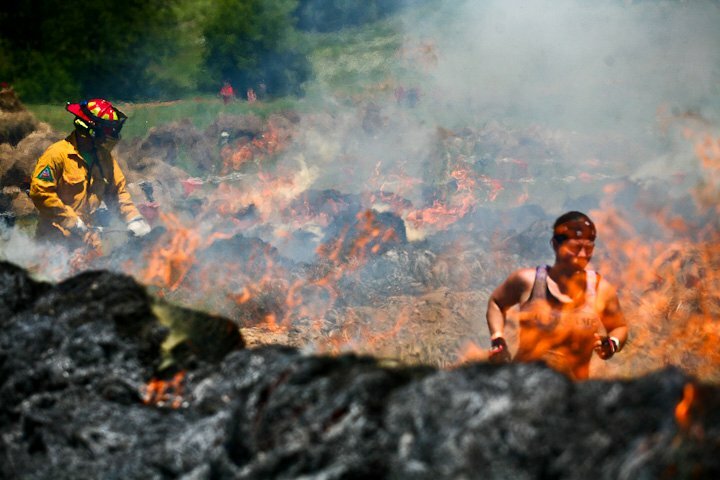 The air was really thick and smoky amidst the flames, meaning that when you came out of the obstacle, the fresh air hit you like, well, a breath of fresh air. Immediately after the Firewalker came a obstacle called Everest (#19), which was a huge slippery quarter pipe. You had to run up the pipe and grab the top to pull yourself up. If you couldn’t, there were plenty of helping hands at the top to grab you and help you up. My goal was to run straight up the ramp, which I did. Just around the corner was the 20th obstacle, Ball Shrinker. This was a rope hanging low over the water. You had to hang from the rope and pull yourself along, hand-over-hand. My original goal was to put my feet up rather than letting them rest in the water, but the ropes were burning my ankles. This obstacle was actually long enough to make your grip strength pretty tired by the end, but it was pretty fun to pull yourself across the surface of the water. As a whole, I remember this section of the race more for how much the runs hurt than how difficult the obstacles were. 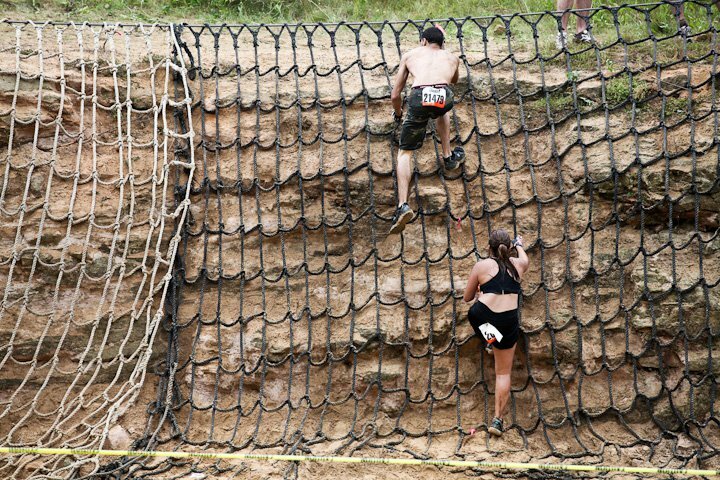 When we finished the 20th obstacle, we hit the 7 mile marker, meaning the rest of the race would be a 5k…. with some crazy obstacles mixed in. Next: Electrocution and The End! Justin thanks for this update, I have been waiting! looking forward ot the next. great post, as usual. Sorry for the wait! I was out of town! Next one is up and last one is forthcoming.